Do you have the ingredients in your pantry to make several lunches or dinners with the addition of a just few fresh ingredients? There is always pasta when all else fails, but wouldn’t it be nice to have some other healthy options when you open up the door to your pantry? Whole Foods Market® has recipes on their website and on their Whole Story Blog utilizing these pantry staples. 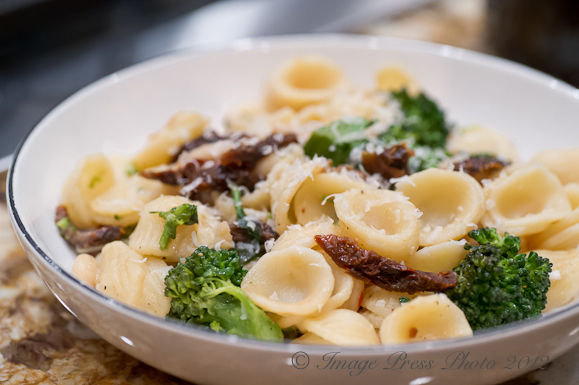 One of their recipes I tried was Orecchiette with Broccoli Rabe, Sun-Dried Tomatoes and White Beans. The only ingredients you need to complete this dish (beside the pantry staples) are garlic, Extra-virgin olive oil, Parmesan cheese and broccoli rabe. The dish comes together quickly and makes about six servings. I substituted organic broccolette for the broccoli rabe since we find the latter bitter. The broccolette required a little longer to cook, but was excellent with the dish. 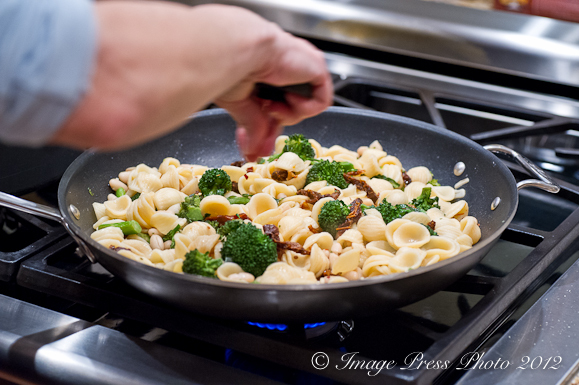 Next time I would prepare a light white wine, garlic and butter sauce to add more flavor and moisture to the pasta. I would also use sun-dried tomatoes in oil. I added a pinch of red pepper flakes to the dish for heat and some additional Parmesan cheese. The basic recipe is a good starting point and with a few additions it would be a nice light pasta dish for a weeknight’s supper. 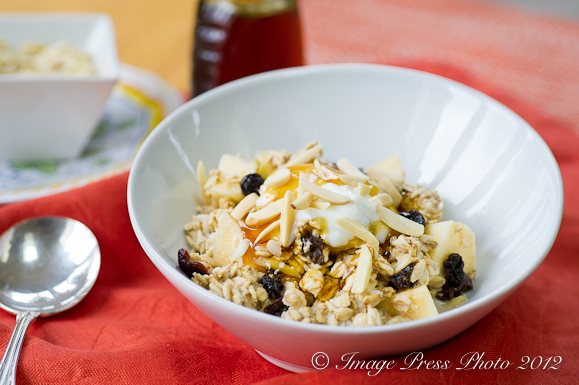 The second recipe I prepared with my healthier pantry staples was Overnight Oatmeal, which is a variation on Muesli. I made the basic recipe which included two cups of rolled oats and your choice of two cups of milk, soy milk or almond milk. I chose to use the almond milk for additional flavor. I lightly toasted the oats prior to soaking them in the almond milk overnight. Their recipe calls for the addition of lemon zest and vanilla and suggests chopped nuts, peaches or apricots and agave nectar, if you like it sweeter. I added the lemon zest and vanilla, but changed up the fruit and went with a mixture of dried fruits (raisins, blueberries and cranberries), fresh chopped apple and slivered almonds. Topped with some vanilla yogurt (Greek or regular) and a drizzle of local honey, this is a delicious and healthy way to start your day. 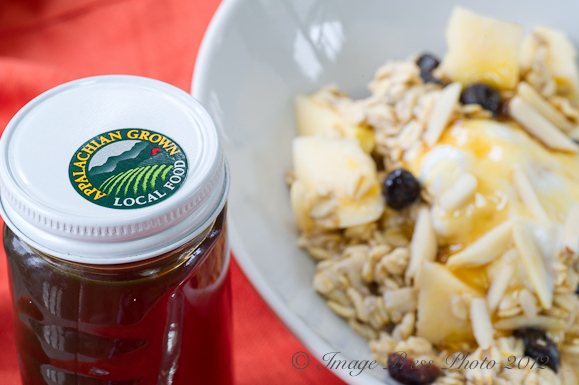 Don’t forget to drizzle the oatmeal with some local honey! Pantry Staples for a Year – Each grand-prize winner will receive a Whole Foods Market® gift card for $599 to use for stocking your pantry for a year. Customized elfa® pantry system from The Container Store ($500 value) – Each grand-prize winner will receive a customized pantry design from The Container Store and a $500 elfa® Store More Card to makeover your pantry. Be sure to head over to their blog to enter their contest by January 31, 2012. In the meantime, here is how you enter to win the $50 gift card giveaway on Bunkycooks.com! You can enter up to three different ways. Leave a comment telling me what dish you would make with these healthy pantry staples. 1. Follow @bunkycooks on Twitter and become a fan on Facebook. Leave a comment here indicating that you are now a follower and a fan. If you are already, you can leave a comment saying you are. 2. Follow @Whole Foods on Twitter and become a fan of on Facebook. Leave a comment here indicating that you are now a follower and a fan. If you are already, you can leave a comment saying you are. This giveaway ends at 5 pm EST on Tuesday January 31, 2012. I will notify the winner by email. Please get back to me with your shipping information within 48 hours or I will choose another winner. 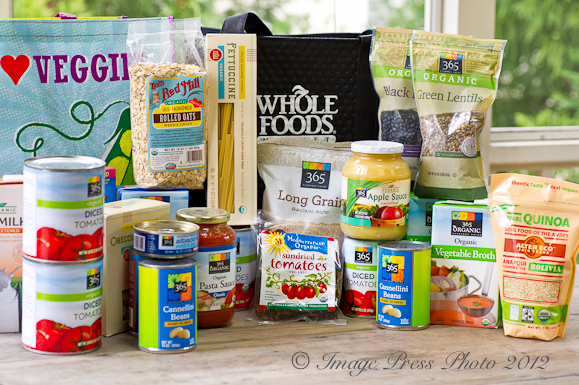 Disclosure – Whole Foods Market® provided me with the 23 Healthier Pantry Staples and the $50 gift card giveaway for my readers. You will need to prepare this the evening before to let the rolled oats moisten in the milk. I toasted my oats in the oven at 350 degrees for 10 minutes (stirring halfway through) before mixing them in with the milk. 1. Combine oats, milk, zest and vanilla in a bowl, cover and refrigerate overnight. 2. The next morning, scoop oatmeal into bowls and mix in your choice of nuts, dried fruits and chopped apple. Top with yogurt and a drizzle of local honey. I think I’d make a hearty quinoa salad with sun-dried tomatoes, fresh broccoli, and cannelini beans. Thanks! id make some spicy lentil soup!! 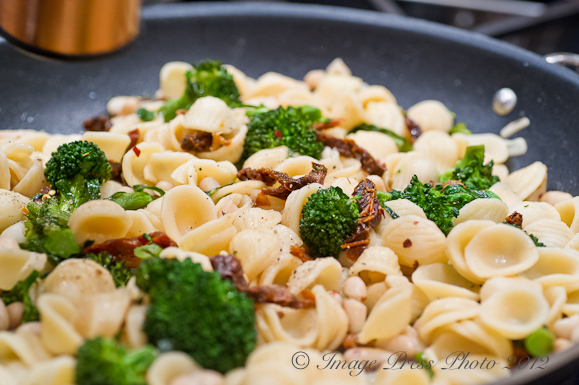 i would make the Orecchiette with Broccoli Rabe, Sun-Dried Tomatoes and White Beans – as you illustrated above. it looks great & delicious! Mmm, a hearty bean soup with a quinoa salad on the side. i follow Whole Foods on Twitter and am a fan of on Facebook. I would make a bean stew . I would make a rice & bean soup and a pasta dish with sundried tomatoes. If I get lucky and win this gift card, I’m most certainly not buying healthy stuff 😉 Chocolate aisle, here I (hopefully) come! That oatmeal looks absolutely phenomenal, Gwen. I bake and cook high calorie for occasions, but I do actually eat healthy most of the time. Will make this for sure! I would make lentil soup. Wow, those dishes look delicious!! If I won, I would probably make a pasta dish with the sun-dried tomatoes. I am following you on twitter and facebook. I am following WHole Foods on FB and twitter. I would make a tuna salad with sun dried tomatoes and beans, yum! I like Bunkycooks on Facebook. I would definitely make the oatmeal. I love oatmeal and that one looks awesome! I would make black bean and green lentil chili! I follow you on Twitter and on Face Book. I follow Whole Foods on Twitter and Face Book. I wanna make Orecchiette! I’ve never seen that before. I’m following you, and a fan on FB. I’m following and a fan of Whole Foods! I follow the Bunny and it would be great for my NY resolution! Woo hoo! I would definitely be making Lentil Soup! I got a great recipe for a quinoa salad on Tasty Kitchen that my husband and I both love. It’s healthy and makes either a great main course with meat added or a great side dish as is. Lentil and bean stew! Especially now that it’s winter and chilly in Chicago! Like and follow bunky cooks. Like and follow Whole Foods. 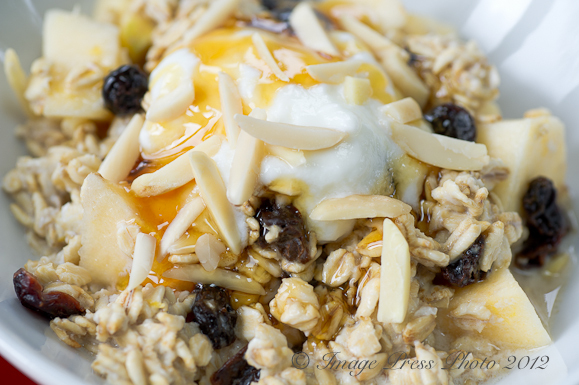 I would make your overnight oatmeal–looks delish and nutrish! I like/follow you on Facebook + Twitter. I like/follow Whole Foods on Facebook/Twitter. I can’t wait to try that oatmeal! I’d like to make the zesty quinoa with broccoli and cashews. I am a follower on Twitter and a fan on Facebook of Bunkycooks! I follow Whole Foods on Twitter and am a fan on Facebook. I would like to make lentil soup and start using almond milk more. I’ll make a quinoa lentil salad. I’d have to go with a classic favorite of ours – pasta loaded with vegetables, homemade sauce and fancy cheese. I’m thinking of organic shell pasta, broccoli, onions, garlic, red peppers, tomatoes, sundried tomato alfredo sauce, and a combination of parmesan and feta! Yum! I would make a bean/lentil chili! I shop almost exclusively at Whole Foods because of the high quality ingredients. I would make a white bean chili with the pantry items. i follow Whole Foods on Facebook and Twitter. Hii I would love to try making black bean/brown rice burgers or black bean brownies, but I dont know if that would work since cocoa powder isnt part of the list. I would make a healthy stir fry with fresh veggies and quinoa! Thanks for the chance to win! I would make a pasta dish with the black beans and sundried tomatoes, adding some olive oil, garlic and onions. I follow you on twitter (@jednc2) and like you on fb. I follow Whole Foods on twitter (@jednc2) and like Whole Foods on fb. Oh yum! I’d make some cilantro black beans over rice! I would make brown rice with spicy lentils. I have been wanting to try the Zesty Quinoa with Broccoli and Cashews. I am a follower of Whole Foods on Twitter and a fan on Facebook. I think some apple oatmeal scones would rank right at the top of that list! I already follow you on Twitter and on Facebook! I already followed Whole Foods on Twitter but now I am a fan on Facebook as well. What a great giveaway! You know I love Whole Foods! I would make a lentil pasta dish…in fact, I think I’m going to go ahead and do that tonight! It sounds just about perfect. Thank you for sharing and for inspiring me! I would make a super-easy southwest chicken bake which includes brown rice, chicken broth, and black beans. Fettuccine with sauteed garlic, sundried tomatoes, and mushrooms, tossed with goat cheese and Parmigiano Reggiano. Black bean quesadillas with whole wheat tortillas. Sauteed garlic, onion, red bell pepper, etc., topped with extra sharp cheddar. I have a pasta recipe I love to make that uses canned white beans, canned tomatoes and fresh arugula. Gwen, I would probably make a SuperBowl dip with beans, rice, tomatoes and sun dried tomatoes. Of course I would add some southwest spices, sour cream and cheese. I am in the process of restocking my pantry so this would be cool. I would make some type of meat and vegetable soup. Love this overnight oatmeal. first I thought it’s the slow cooked version, but this one involves no cooking. Going to try it out! Thanks for sharing Gwen!